Yes, but I don�t know why. The realisation that what you are doing is intensely limited, is in itself liberating. I have long been of the opinion that what a painting looks like is actually a matter of complete unimportance. For a start, those cud-chewing discussions about possible resemblances to things outside the painting are over. The� brain obliges us to �make sense� of what we look at, even if it is only to deride a painting for looking like �two poached eggs in a sea of snot� (Peter Fuller, in 1980, on a painting by Geoffrey Rigden). To a greater or lesser extent, whatever marks are made, these will always look like something. What matters, beyond this, is the intention of the painter. The heat has also gone off the depiction/non-depiction debate; painters can now move freely in either direction without invoking the outrage, the charge of betrayal, that Guston�s return to figuration caused in the late 1960s. Likewise de Stael, always angst-driven, who moved in the same direction in the early fifties. Some of the paintings that Patrick Heron made half a century later, after a long career exploring colour, are blithe depictions of rooftops and rose-gardens. A few months before he died last year, John Hoyland quite casually said to me that for him personally, abstract painting was finished as he had exhausted its possibilities. But when painters deliberately set out to paint non-figuratively, they are at once claiming the right to make any mark they like anywhere on their surfaces and at the same time� accepting the existential dilemma of decision-making in a void, absolutely on their own. Painters, of course, solve all this by finding a way of working, presumably� in accordance with their own private musings. Each to his own. From a no-holds-barred swashbuckling loftiness to politely shrinking reticence, there are as many ways of using paint as there are painters to use it; anything is possible. And at the end of the day, of course,� painters like their work to be seen. Even though it may not be particularly observer-oriented. The work of Geoffrey Rigden makes no concessions to observer-comfort. It takes the risk of coming with a skin missing.� There is no attempt whatever to impress, to ingratiate, to seduce with good behaviour, with bravura, chromatic thrills, or even come-hitherness. On the contrary, each work is so singular, so much its own self, it is almost as if it doesn�t like being looked at. The free-standing constructions in particular, feel like people on their own, and uncomfortable with it, at a social gathering. Almost all Rigden�s recent paintings have been worked on for a very long time. And not just in resolving finicky bits of detail, but sometimes in radical recasting. Look at all that over-painted red in Interior 2006, the almost uncomfortable surface in Curium 2000-�03, at the same time registering the final forceful resolution of the design. That yellow� band along the bottom of Meeting with Remarkable Men 2005 pulls the whole of this very satisfying work together and repays detailed inspection as to its history. The insistent lack of compromise in all these paintings is made up of a firm simplicity of design, a regular use of extra-coarse pumice and an obsessive use of black. It is the evidence of a history, discernible in the incomplete obliterations, that constitute touch in Rigden�s work. The fact that the surface hasn�t been cleaned-up ready for a Cork Street party contributes to the vitality of these images. Like the best human faces, these paintings look lived in. I asked Rigden how he thought his work had changed in the last few decades; he said he had become more self-critical. In the larger paintings of twenty years ago, such as Cycladic Violet 1990 or Off Minor 1985, the paint has been used more transparently, less trenchantly, but the drawing is already off-beam, somehow arresting the eye which might otherwise have slid away in search of something more obvious. Lovely dribbles. The more recent work tends to be smaller in scale, more obsessively worked, and more chromatically unusual. At their most successful, such as Reflexion 2004-�08, they achieve a jaw-dropping allure and a dry-eyed stillness which is both beautiful and visceral. Here is release from condescension. I go further; this is a new ecstasy. In 2009 the philosopher Roger Scruton wrote that a sense of beauty depends at least to some extent on an intellectual construct. An artefact which is purely sensory in appeal, such as a lovely taste or smell, in some way falls short of whatever it is that we sense as beauty. Rigden, for all his cool, has a razor-sharp awareness of the massive constraints which define a painting, that a painting has only three realities: area (surface plus edge), chroma and facture. The rest is virtual, put there by the eye. Even more, he seems to invite yet further limits, denying himself the luxury of enjoying the infinity of ways in which colour areas can meet. In a Rigden the colours meet head-on. As Stravinsky once pointed out: anything which reduces constraints, reduces tension. It is the very lack of conventional painterly pleasure which gives this work its punch. Most European painting, say from Masaccio to Monet, has been concerned with trying to persuade the viewer that the painting itself wasn�t really there, that it consisted of a space into which you look, occupied by madonnas and apples and bottles and suchlike.� In other words, the painting contained an image. Residual, uncontrolled illusionistic space still, amazingly, seems to infect a great deal of European abstract painting. It is as though there is a cavalier disregard, or even unawareness, of the picture plane, with the result that the images appear to be full of holes. If a painting is to hang in the mind later, it seems quite reasonable to expect it to be able to hold the wall in the first place, and for you to be able to tell where things, colour forms, in it actually are. Clement Greenberg may not have explicitly stated, but certainly implied, that if a painter is going to go so far in transforming an object that you can�t tell what it is, then surely he is obliged likewise to transform the space it�s in. Rigden purveys a Greenbergian assertion of pictorial flatness. It is this, plus the achieved tautness of design, which gives his work its bristling energy and tension, a far cry from the pseudo-energy of evidential exertions in the handling of paint. In this Rigden is not only ahead of his time, as pointed out by Tim Hilton in 1980, but also harks back to the early Florentines and the Sienese School. Giotto, Duccio and Neroccio come to mind. Like Rigden�s work, with these painters, the painting itself is the image. This resonance reaches further back still, particularly in the drawings, which unlike the paintings are made swiftly, and the linocuts, to late Neolithic Cycladic art. This shares Rigden�s firmness of line, directness of utterance, and frontality. In conversation with Rigden about his constructions, he suddenly and vehemently declared that he abhorred waste, that putting refuse to new use really mattered to him. His constructions mostly recycle bits of boxes, corrugated paper, bottle tops, corks: real garbage. But whereas a lesser artist might be tempted to make some trite point about consumerism, Rigden achieves a radical and total metamorphosis, so that while the starting points are glaringly visible, they are noticed only secondarily. As with the paintings, these works are direct, rough-hewn and unexpected. There is never anything habituated in this artist�s work, no predictable way of working. There are playful echoes of Klee and Gottlieb here; in the recent Omega� there is a distant recall of Braque�s 1950s studio series, not just because of the birds, but in the design and tonality. And who else could incorporate together an old shoe and a weaver�s comb so tellingly? Rigden was part of that emergent consciousness in British painters of the 1970s who were discovering what was being done in the States. These earlier paintings of Rigden are often Hofmann-hot, loosely painted, with tube-squeezed swirls and a somnolent chromatic complexity. They seem very much of their time but in no way tired. They are very easy to like. 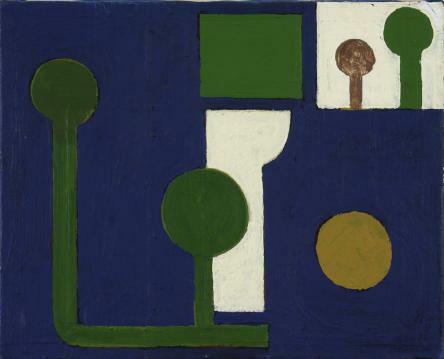 Gottlieb is the only New World artist whose work� still relates naturally to Rigden�s, particularly his pictographs. Both artists are protean, yet instantly recognisable, without habituated trademarks, without recourse to obviously affective mark-making. Neither are particularly genial. And just as Greta Garbo made the others look suburban, do not Gottlieb and Rigden somehow make so much else seem a little schmaltzy? It is probably the lot of the truly great artist to be unable to �explain� his work. Rigden, while never failing in insight over the work of others, a trait which made him beloved of students, is curiously diffident, almost inarticulate, about his own. Does it matter? Braque once commented that the only thing that mattered about a painting was what couldn�t be put into words. Bacon, more abrasively, said it was useless talking about painting: �you just talk round it.� Hoyland commented several times that paintings �weren�t meant to be understood, only recognised.� Understanding implies verbalisation; recognition is something more subtle, more indefinite, harder to reach. I commented earlier that what a painting looked like was unimportant. Like people, it is what they are like rather than how they look that matters. It takes courage and practice to �feel� a painting with the eyes. One doesn�t ever really understand other people, but kindred souls can be recognised. We all know that paintings are a form of self-portraiture; you get to read them without verbalisation and most emphatically without the art psycho-babble which sometimes passes for insight. You arrive at silence. In the end, maybe all one can ever say of a painting that one responds to is to reaffirm Olivier�s bafflement.